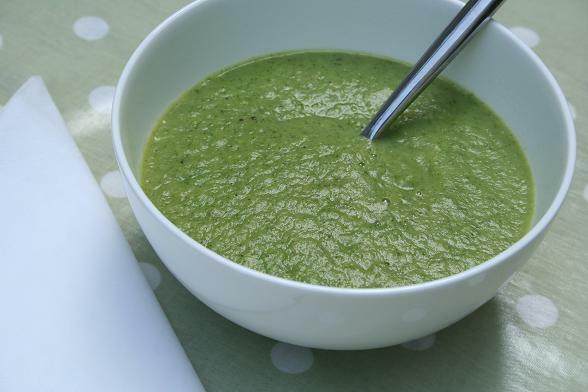 “Spring Soup” makes this sound very grand when, in fact, it’s actually just a combination of leftovers from the bottom of the fridge: the watercress from last week’s salad and the ends of the asparagus that we barbecued on Sunday. Start by sweating the onion and garlic in a little oil and some salt for about 10 minutes. When softened, add the potatoes, stock, asparagus and salt and pepper and simmer for 15 minutes. Add the watercress and cook for two minutes. Blend. Check for seasoning and rectify if necessary. This was obviously very quick and cheap to make and was great for lunch with a toasted bagel. I think some paprika would have worked well too, stirred in with the onions. Subscribe to comments with RSS	or TrackBack to 'Spring Soup'. I love soups like this! Quick and healthy!! I always say that the best soups are born of leftovers, or stuff in the fridge that needs using up 😉 I love the vibrant colour of this soup & can just imagine its fresh taste!